A gemstone or diamond is usually the highlight of a jewel. A lot of gems are relatively small, making the process of mounting it to jewelry even harder. Still, they are crucial for jewel creation because of the many possible varieties they can add to the appearance of a jewel. There are several setting types, each referring to the different ways in which the diamonds or gemstones are kept in place on the jewel. The usual method for doing this (although many variants exist) is to put the diamond in place, and then put gold on the outsides to keep it in position. 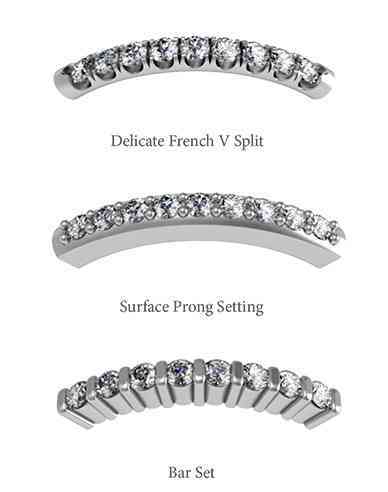 Fancy settings are mostly used with rings and earrings, delivering distinguishable results. But you will find all sorts of settings on all sorts of jewels, which as a fashion constantly evolves. 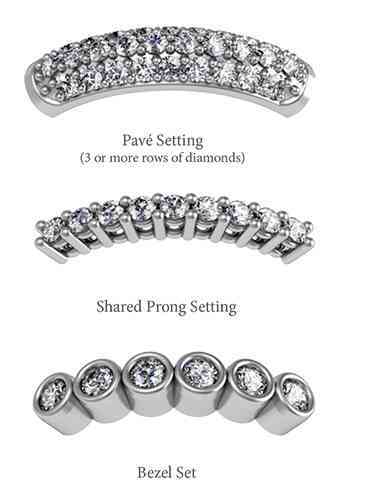 In general, often a small row of diamonds are wanted, or a block covered in diamonds. 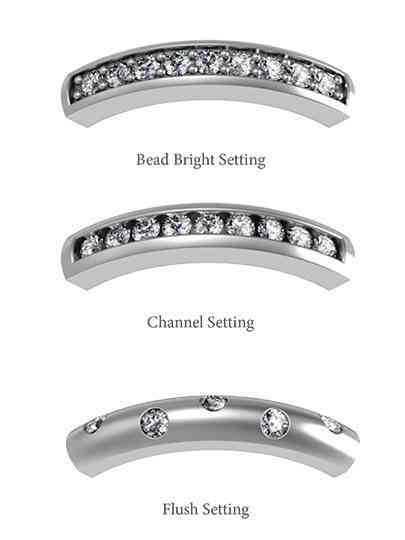 For this effect people try to keep the diamond setting to a minimum with the intention of complimenting the effect of many diamonds grouped together. As a general rule the heavier the setting the less one can see the gem. 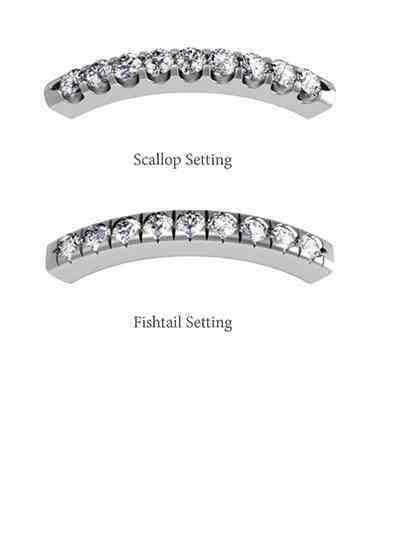 With the setting taking so much attention away, most designers and clients prefer lighter settings, especially in the case of more expensive stones such as diamonds. Less expensive stones are however more often paired with heavier settings as emphasis on the gem or diamond is much less important. When people refer to the setting of a gem, they refer to the type of method used to keep it in place. Setting stones, and especially diamonds is a trade that requires years of training before reaching high levels of perfection. From a historic perspective, it was often taught from father to son and carried through the generation. For a good idea on the different setting types in practice you are invited to browse our shop to see them in practice. 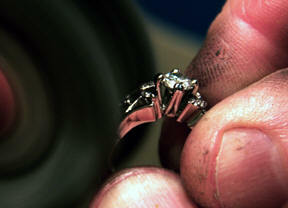 Casting is the name of the process in which the shape of a finished jewel is taken and used to create another. 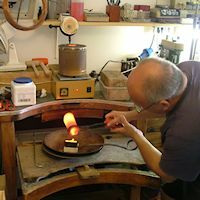 For example a block of metal with a smooth top surface and a ring-shaped hole in it can be used to supply the basic shape of a ring once you pour melted gold into it. Casting is not only used for mass production, even when creating a unique jewel with fixed shapes or diamond settings the creator often has to create a custom cast. The first version of a custom cast is often made from rubber, and it evolves from there. 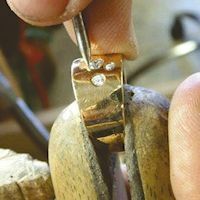 By applying a casting technique the jewel creator is able to minimise the amount of gold that has to be cut out and the amount of work that goes into bringing the piece to life. Lately there have been a significant amount of evolutions in the creation of casts. Now they can be printed in 3D (should you desire, we can also create any custom jewel or engagement ring you can ask for) for more perfect precision. Although there has been some progress in the creation of 3D printers that print directly, it is and will probably stay too expensive for any period in the foreseeable future, so casting is here to stay, and will remain, either manually or with 3D printing the way of jewelry creation. A man pours molten gold into a cast. Engraving is the removal of gold from the surface of a jewel for decorative purposes. It could include custom shapes like flowers, heart and seashells (and many others) but also to write down something on the jewel. Most people choose to engrave words or dates. The most common engraving for example is the date of the wedding day being engraved in the wedding rings, along with the name of the bride in the grooms ring, and the name of the groom in the bride's ring, symbolizing the exceptional occasion of bonding with one's love and it being a special date. For custom shapes there is no other way but to do it manually. A wide variety of tools exist for this purpose. Humanity has a long history of engraving engagement and wedding rings. With modern machines made for this exact purpose words can be written with perfect edges. 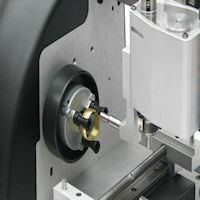 Considering the much higher quality of the engraved words and numbers they are almost exclusively written with engraving machines, with both jewellers and jewel creators recommending to use the machine when possible. Polishing is the process of turning the outside of the gold a shiny, smooth feeling and appearance. This can be done by hand, or by machine.When done by hand, the jewel is held in place with pressure to allow the goldsmith to rub the jewel with special polishing materials.When performed by a machine, a special brush spins very quickly. The goldsmith rubs the jewel onto the spinning brush, thereby making the surface smooth. It is not a dangerous process, and contact with the skin does not result in problems. After many years the polished effect starts wearing off. It could easily last for decades if treated appropriately. However, this is often not the case, but there is little reason for concern. It's a very easy step to polish a jewel again, making it look like it completely new! 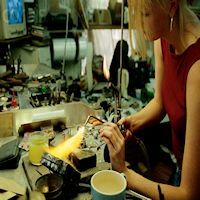 Soldering is the process of heating metal and connecting it to another piece of metal. Jewels are often made out of several different pieces, and soldering them together is a very crucial part of jewel creation.Due to chemical reactions that occur, after the soldering is done and while the gold is still hot, it is rapidly cooled in water. This is to prevent the occurrence of spots and discoloration of the gold. After the soldering process is done, the gold is often left to sit in a tub of special acid to remove any impurities.A very frequent occurrence in the soldering of gold and other metals is the usage of tiny balls that melt when a hot flame is used.